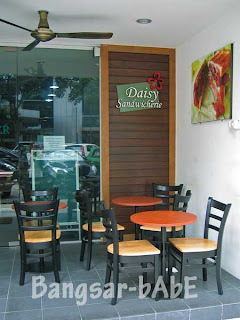 Last Friday, Shum and I decided to try this sandwich bar in front of Uptown 1 called Daisy Sandwicherie. The place was relatively empty, with only 2 tables occupied. 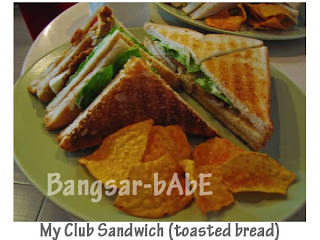 We both ordered the club sandwich (I had my bread toasted) and a cup of brewed Lavazza coffee each. 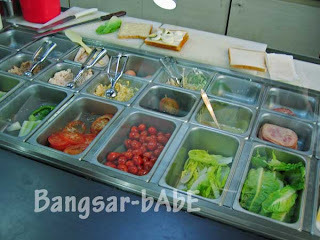 The sandwich was a triple deck one, with ham, cheese, turkey bacon, sliced egg, tomato and greens. Our sandwich came with a side of chips, cheese “chachos” to be exact. Although it was decent, it wasn’t as good as O’Briens. I thought the sandwich could do with a bit more seasoning and the bacon was a tad too hard. I was quite disappointed with the coffee. It was quite insipid and wasn’t as fragrant as it should have been. The coffee that Shum brews daily at the office tasted better than this. However, I’m no coffee connoisseur so don’t just take my word for it. It would have been a fairly decent lunch had it not been for the awful music they played. 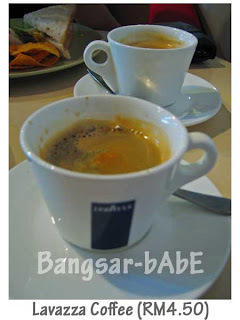 Tasteless and loud, it made Shum and I finish our lunch quickly just to spare ourselves from that dreadful noise. Verdict: While the sandwich was decent tasting, the distasteful music killed our lunch experience.